So you’ve bought an Aeropress…errr, now what? Now it’s time for you to learn the tricks of the trade. Grind your beans (yes, grind them fresh). Experiment, but we found that a grind a bit courser than drip coffee works well. If you are using the paper filter, pre-moisten it to get rid of the paper taste. Just pour some boiling water over it. Now, we like the inverted method of using the Aeropress, so place the plunger upside down, with the black rubber seal touching the bottom of the number 4 circle. Pour your coffee into the Aeropress. Start your timer. Slowly pour water into the Aeropress up to the Level 3. Using the paddle, stir a couple of times. Pour in some more water, until it reaches Level 2. Now, place the pre-rinsed filter paper and black cap onto the plunger and screw it in tightly. When your timer reaches the 1 minute mark, slowly turn the Aeropress to a 45 degree angle and swirl the coffee around a couple of times. 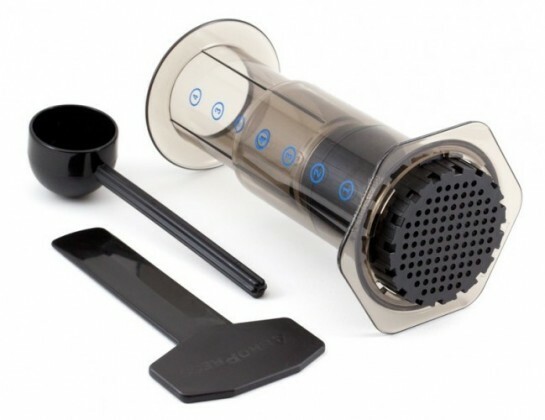 Turn the Aeropress onto your cup, and plunge with steady pressure, stopping as soon as you hear a hissing sound. Sit back, and enjoy your coffee. Add water to dilute to taste, or not, whatever. If you already mastered the basics, hop over the World Aeropress Championships website for the winning recipes from the last couple of championships.